I didn’t remember that much about this particular issue and there are a number of good reasons for that. The first one is that it showed up in the mail at home while I was off in college doing collegey things. So I didn’t get my hands on it until I got home for the Christmas break. And second, by the time I got back home, I had been seduced by the other side (Marvel Comics – clean it up, will ya?). The books I brought home with me from college contained stories about Spider-Man, Iron Man, and Captain America. I had definitely begun worshipping at the Church of Stan the Man. Third, and the hardest one of all to believe, is that the Silver Age Flash was nearing the ten-year mark in it’s run at this point. So it’s no surprise that each and every issue was no longer pristinely archived in my memory banks. All of which made this book read like some sort of lost issue and made it kind of fun to re?discover. It turns out to be one of those well turned John Broome SF stories that had so endeared me to the character from the get go. The cover certainly seems to be Julie Schwartz inspired, but Broome then takes over and crafts a tale about a visitor from another dimension who appears at the United Nations demanding that the Earth turn over the Flash or risk being destroyed. 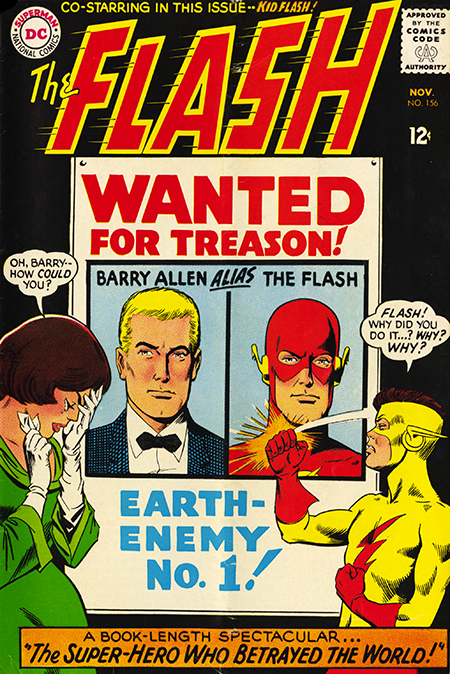 In an effort to be helpful, he reveals the Flash’s secret identity to the world, thus covering the cover so to speak. The Flash later unwinds that by turning time back, but it momentarily creates a sort of fascinating B plot. Iris is, of course, mad at Barry for lying to her all this time, but she says that she assumes Barry would have told her once they were married, and he wholeheartedly agrees. Interesting. Well, we’ll see.